← Wego Health Writing Challenge, Learned the Hard Way…. This is not a random page but one of my favorite books about living with illness. 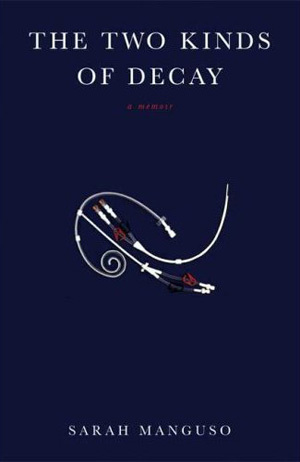 The Two Kinds of Decay by Sarah Manguso is a memoir of the autoimmune disease that tore through the author’s twenties, a decade of recurrent paralysis, collapsed veins, chest catheters, the deaths of friends and strangers, addiction, depression, and the trite metaphors that accompany prolonged illness. Was the CIDP a physical manifestation of a spiritual illness? Did the medication trigger the depression, or did the depression trigger the CIDP? What about those yogis who can lie down on a bed of nails, then arise, streaming blood, then stop the flow of blood from each wound individually with the power of their minds? Isn’t frailty often a choice? And if frailty is a choice, then isn’t autoimmune disease a semi-intentional suicide? That statement stops me in my tracks every time I read it. As a woman with type 1 diabetes, I too have an autoimmune illness, and until I read this book, I’d never really considered the implications of an “autoimmune illness.” I know that our disease are very different, but like Manguso, I wondered what it meant that my own body was waging a war on itself? When I was little and feeling sick, my dad used to tell me to think about polar bears. The polar bears were supposed to be healthy cells fighting off my sickness-my fever or strep throat or whatever it was at the time. It was the 70’s and my parents were hippies and this was his idea of a healing, positive visualization. But I didn’t like the idea of polar bears in my blood. It made me queasy. I just wanted to have someone give me medicine and make it all better. I thought of the polar bears again when I was diagnosed with diabetes. I think it was more of a sarcastic teenage thought like, “Yeah, see dad, those polar bears didn’t do any good. Look what happened to me.” I wallowed in the ‘poor me’ phase for a long time. And I definitely didn’t believe that I had any sort of internal choice in the matter. I was stuck with diabetes and there was nothing I could do about it except feel sorry for myself and/or ignore it. Looking back now, I see that ignoring it was a sort of suicide. It wasn’t until I let my diabetes out of hiding that I felt like I had a choice about living well with diabetes. 26 years later, I chose how I manage diabetes. I did not choose to be diagnosed or to be “frail,” but I do choose to live my life well. This entry was tagged blood sugar management, Chronic Illness, diabetes, living well with illness, type 1 diabetes, women's health. Bookmark the permalink. “Looking back now, I see that ignoring it was a sort of suicide” This is a powerful statement and it speaks to me. Sometimes I choose to hurt myself with my diabetes management (lack of) when I wouldn’t dream of putting a gun to my head or a blade to my arm. Thanks for helping me to think of these things at this time and in this place.